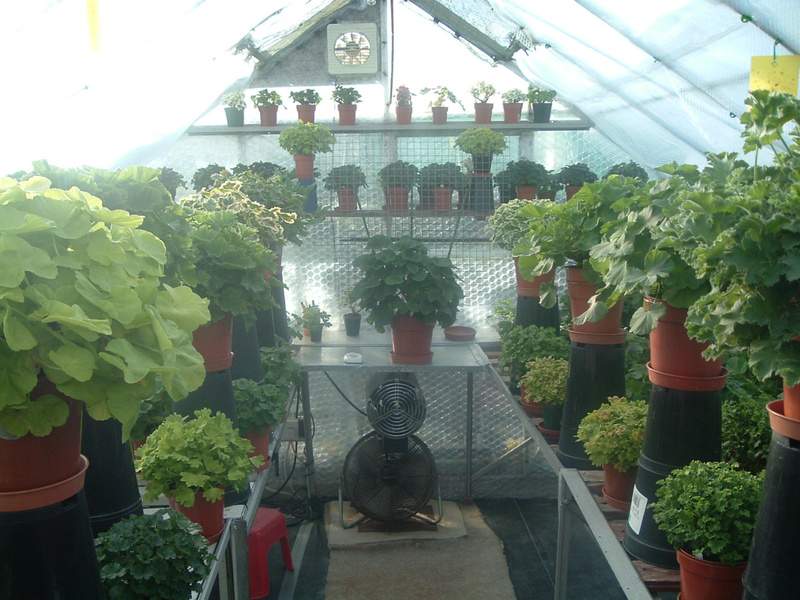 As I want my show plants to keep growing through the cold winter months, I heat them with electric fan heaters. I delay insulating the greenhouses until it starts to get really cold, once into single figures (centigrade) during the day I give in - LOL. 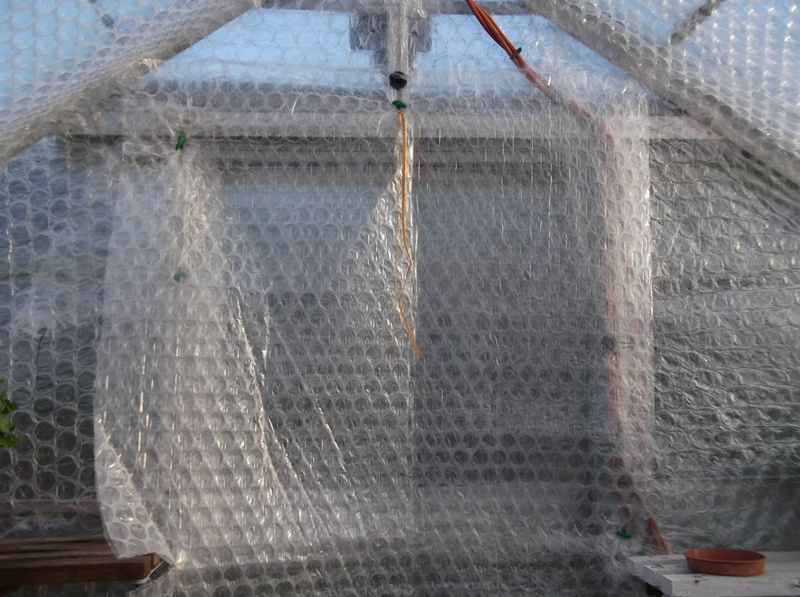 All the glass is cleaned inside and out to help let in more light, before putting in the bubble insulation. I use the large bubbles for the sides and the ends, and small bubbles for the roof. 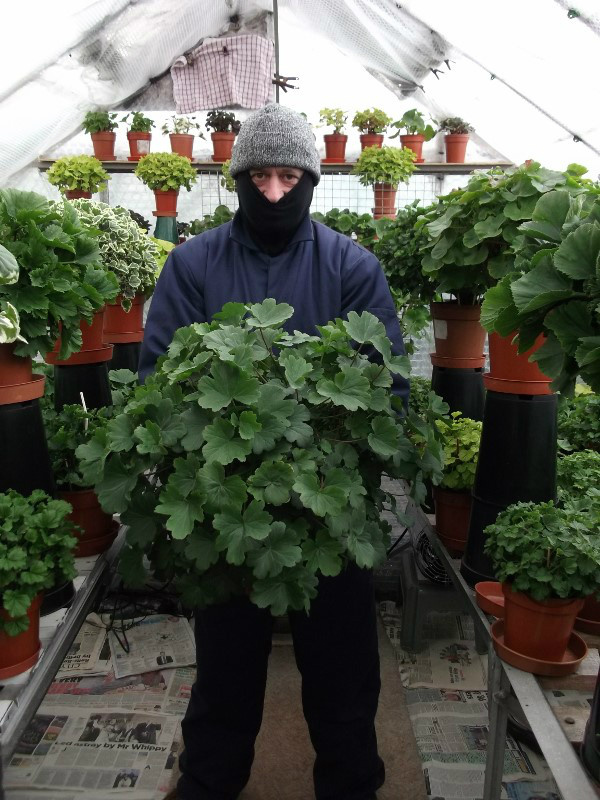 The minimum night time temperature is kept between 5C-6C, which is high enough to keep plants healthy and growing well. Whenever possible the greenhouse windows and doors are opened to keep the daytime temperature from getting too high. Watering from the bottom helps keep the compost dry in the top of pots, also a large electric fan is on most of the time to keep the air moving around the plants. This will go a long way to reducing any threat of the botrytis disease. 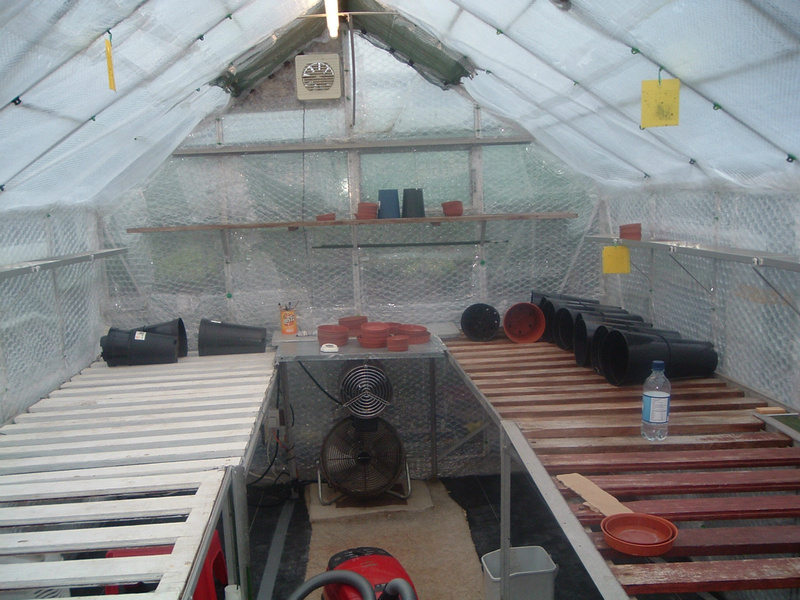 As you can see in the picture I remove all the plants from the greenhouses to insulate it. In the past I have knocked plants over while doing this. 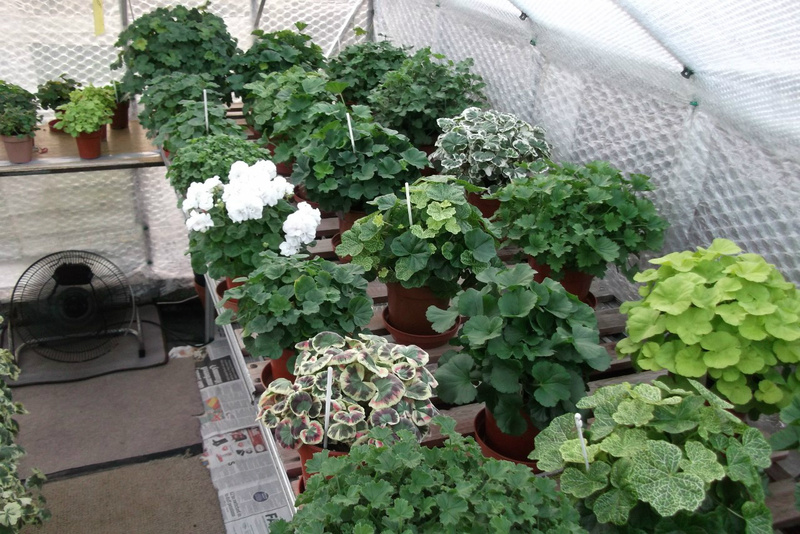 Now I tray plants up and put them under the staging in another greenhouse, if it is too cold to put them outside. My greenhouses are aluminium so I use the green aliplugs when putting up the insulation as they lock into the glazing bars. I find them quick and effective. The greenhouses get a good clean out with a hoover before the plants go back in, this also helps to get rid of anything lurking on the staging or floor. 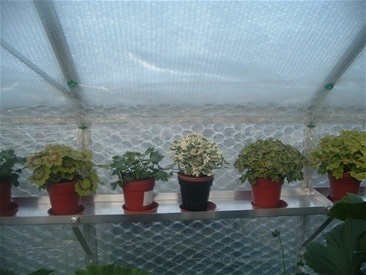 I find that prevention is better then having to deal with any pest infestation, so by keeping greenhouses clean and with regular use of Provado the plants are normally free of pests. 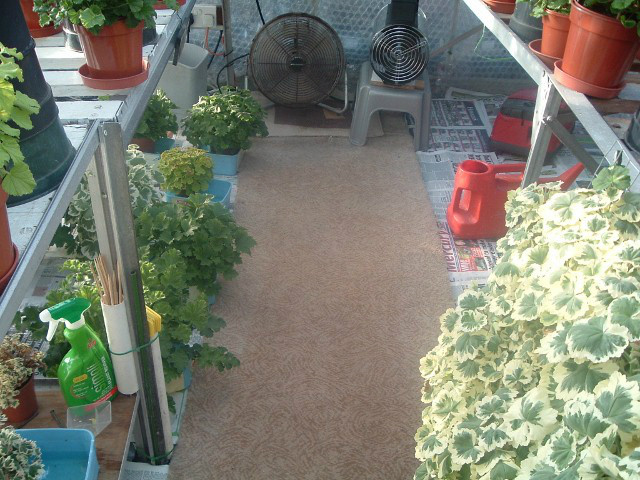 I make a curtain for the doors out of the bubble wrap, which I can roll up during the day to make it easier to access the greenhouses. This just seems to finish the job off and helps keep out the cold winds we get during the winter here. The greenhouses look better once the plants are back in, as you can see I have the largest plants on upturned deep rose pots. This gives me a lot more room on the staging, it also means that the plants get a lot more light and make a better shape. I HAVE TO INSULATE ME DURING THE COLD MONTHS SO TIME TO PUT ON MY THERMAL SUIT. LOOK HOW WELL P.GRANDIFLORUM GROWS DURING THE WINTER MONTHS. To help with keeping Botrytis disease at bay during the cold weather, here are a few things you might find helpful. (1) If, like me, you show your plants and want to keep them growing through the winter, try to keep the minimum temperature at about 5 degs C.
(2) Watering plants from the bottom helps keep the compost at the top of the pot on the dry side. (3) When warm enough open windows, doors or both for as long as possible to refresh the air. (5) An electric fan standing on the floor the opposite end to the door, helps move the air around, especially if your benches are slatted like mine. (6) As I water from, the bottom all the year round, I fill my pots nearly level to the brim with compost. This stops a cold pocket forming at the base of the plant in the hollow you would normally leave to aid watering. (7) Most importantly space your plants well, so that they are not too crowded and to ensure they get plenty of air flowing around them. Plants spaced out on a bench.